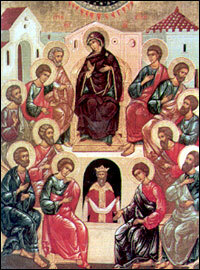 The real beginning of the Church, the moment of its birth, is the feast of the Pentecost, or the Descent of the Holy Spirit upon the Apostles. On the tenth day after the Ascension of our Lord Jesus Christ, His disciples, together with His Mother and other holy women, and some Jews who had come to believe in Christ, - about 120 people in all, - were gathered in a home on Mount Zion. As usual, they were spending their time in prayer and waiting for the Holy Spirit, Whom the Lord had promised to send in His stead. All of a sudden there was a noise from heaven, as of a rushing wind, which filled the whole house. And there appeared tongues of fire that spread out and alit upon each person. And they were all filled with the Holy Spirit and began speaking in other languages. Then Apostle Peter stood before the people and explained to them that knowledge of foreign languages is not acquired through wine and that the disciples could not be accused of being drunk at 9:00 in the morning! What had just occurred was the fulfillment of prophesies that the Holy Spirit would descend on all those who believe in the Lord Jesus Christ. The people were deeply moved by Apostle Peter’s words, and on that day about three thousand people were baptized. Such was the beginning of the spreading of the Gospel, which through the holy apostles and their disciples was spread throughout the whole world.